Kepware develops software solutions for the Industrial Automation Industry that help bridge the communication gap between diverse hardware and software applications. Kepware products enable informed decision-making from the shop floor to the top floor by providing consistent, reliable data across the enterprise. Contel and Kepware have been working together since the early 2000’s, where Contel discovered the robust, high quality and easy to use Kepware solutions for PLC and software communication in the production floor. 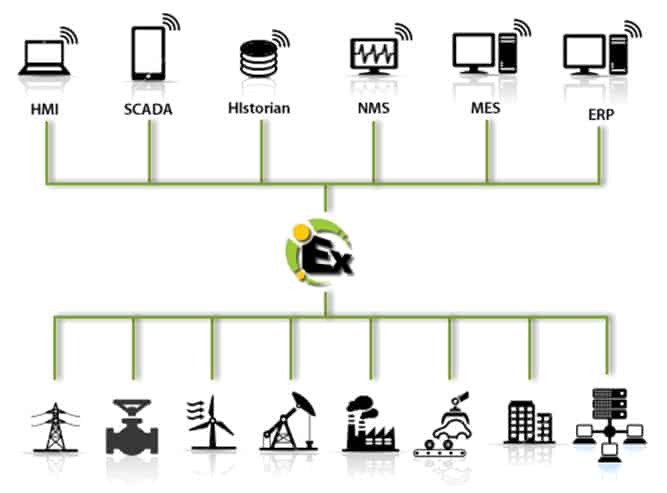 KEPServerEX is the industry’s leading communications platform that provides a single source of industrial automation data to all of your applications. The platform design allows users to connect, manage, monitor, and control diverse automation devices and software applications through one intuitive user interface. KEPServerEX leverages OPC (the automation industry’s standard for interoperability) and IT-centric communication protocols (such as SNMP, ODBC, and web services) to provide users with a single source for industrial data. Designed around the four product pillars of Proven Interoperability, Centralized Communications, On-Demand Scalability, and Industrial Strength, KEPServerEX is developed and tested to meet our customers’ performance, reliability, and ease-of-use requirements. OPC is the leading standard for industrial automation connectivity. KEPServerEX supports the OPC Unified Architecture (OPC UA) specification and many of the OPC Classic specifications, including OPC Data Access (OPC DA), OPC Alarms and Events (OPC AE), and OPC Historical Data Access (OPC HDA). KEPServerEX has preferred access to leading automation software, including iFIX by GE Intelligent Platforms (NIO) and InTouch by Wonderware (SuiteLink/FastDDE). KEPServerEX also supports preferred access to Oracle MES and MOC solutions through their proprietary API. KEPServerEX supports multiple interfaces for integration with IT applications, including ODBC for logging information to a database and SNMP for providing information to a Network Management System (NMS). With the advent of IoT and Big Data applications, KEPServerEX now includes the ability to communicate with Splunk software and cloud services via the Industrial Data Forwarder for Splunk. With the IoT Gateway, KEPServerEX can seamlessly stream real-time industrial control data directly into Big Data and analytic software for Business Intelligence and Operational Excellence. Its customizable data format supports most MQTT and REST applications—enabling users to choose the vendors and communication methodologies right for their system. Some applications require information to be made available from a file or database. This information is typically exported at a predefined rate and includes both current and historical data. KEPServerEX has the ability to export historical Electronic Flow Measurement (EFM) data (via the EFM Exporter plug-in) or historical trend data (via supported drivers) to files and/or databases. RedundancyMaster increases the reliability and availability of your OPC data by allowing multiple OPC servers to be configured into redundant pairs. Each redundant pair seamlessly appears as a single OPC server to any OPC client application. RedundancyMaster can be added to an existing client/server application without any reconfiguration of the application, keeping your processes going without any downtime. OPC-enable your .NET applications with ClientAce. ClientAce provides a drag-and-drop interface to quickly and easily attach OPC items to any property or custom control built in Visual Studio. Furthermore, its full-featured .NET API provides effortless access to OPC UA, OPC DA, and OPC XML-DA server applications without previous knowledge of the OPC standard.